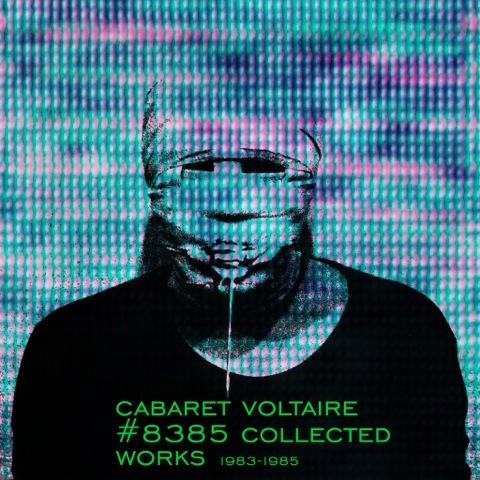 TICKLING MY FANCY MUSIC SELECTION: Cabaret Voltaire, Killing Fields Of Ontario, David Lawrie, Malkovich. Chronicler and curator of West Africa’s (with the exception of a few congruous excursions to South America) rich musical melting pot, Samy Ben Redjeb, under the banner of the Analog Africa label imprint, returns to that fertile hotbed of omnivorous ‘highlife’, Ghana. Previous surveys of Angola, Benin and Nigeria have dug up pure musical gold; from the highly-rated and deemed essential record collection purchase, Africa Scream Contest, to perhaps my ‘enourmed’ favourite, Legends Of Benin, each release can be considered a vital showcase for the continents most vibrant, funked-out and rhythmic workouts. 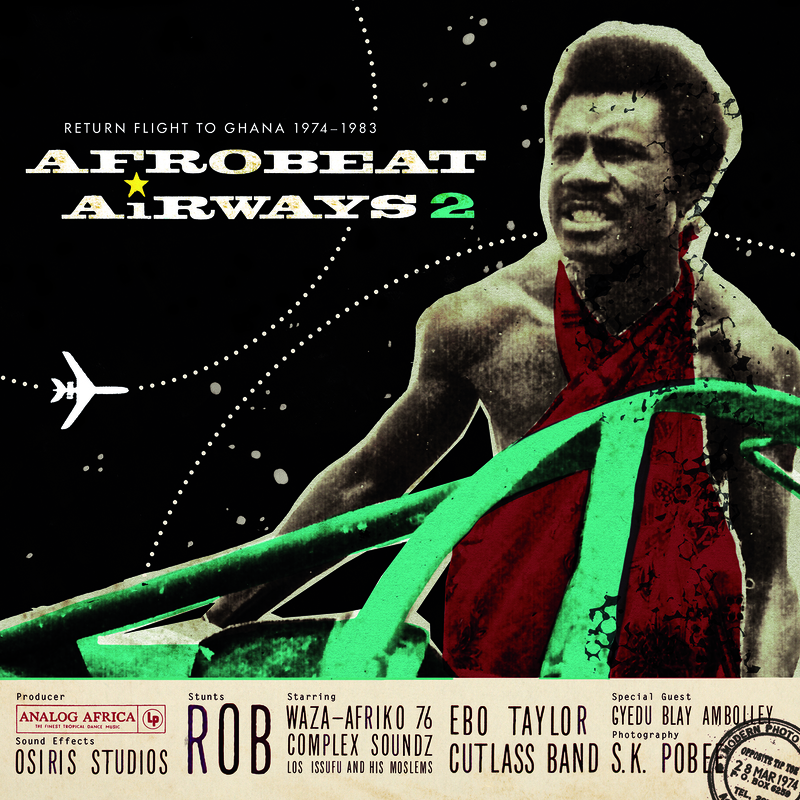 Released back in 2009 the label’s first ‘Afro-Beat Airways’ compilation (REVIEWED HERE) also crossed the eastern boarder into neighbouring Togo; part 2 contains itself wholly to Ghana, crisscrossing Africa’s first nation to gain independence from colonial rule. Lavished in the customary colourfully gilded packaging we’ve come to admire, with an abundance of rare period photographs and assiduous linear notes, Volume 2 appeals to the eye: the refashioned mix of LP covers, candid nightclub shots and energetic overlapping vivid patterns certainly capture the scenes energy. A labour of love, Redjeb and his team go far beyond the role of just collators. Tracking down, if possible, the original artists and bands for permission and of course their stories. A hallowed trip through the bustling markets and streets of the capital, Accra, or on a dusty trail to parts of the ‘self proclaimed Islamic Funk belt’, Bolgatana, the travail is all taken care of on our behalf: all we need to do is kick back and indulge. Attributed to one of the style’s most venerated and respected pioneers, Afrobeat is synonymously entwined for eternity with Fela Kuti, who slipped across the demarcated lines to escape the Biafra war in his Nigeria homeland during the late 60s, to take up an artistically rewarding sojourn in Ghana. Catching the local highlife flavour, Kuti added funk and jazz to the already heady mix to produce Afrobeat; a groove and natural rhythm both spiritually soulful and danceable. It took a while for the ‘shock waves’ to get going, but when they did, Ghana became an oasis of the movement; played out in the legendary nightspots – an integral part of Ghana’s cultural heritage and story in itself; covered in no small part by the album’s accompanying booklet. Throw in the influence of such giant luminaries as James Brown, Wilson Pickett and Otis Redding with reverberations of soul and R&B and you have something, almost, uniquely African – though one of the featured artists on the compilation, Tony Sarfo (And The Funky Afrosibi) found his ripe ‘soul licked’ backbeat instrumental, ‘I Beg’, mistaken for an obscure US record. Touching down in the southeast town of Kumasi, the collection opens with the lumbering heralded horns and choppy funk guitar licks of The Uppers International – the only returning band from the first compilation. As with many of the fruitful tunes on offer it features not only a regular Uppers’ piqued, piped tool of trade, but the Afrobeat and highlife style’s obligatory reedy instrument of choice, the Farfisa. Fellow Kumasi residents and journeymen, Vis-A-Vis, back the Ivory Coast born Pierre Antoine on his two-speed (from swaying hipped reflective soul into busy Stax revue in seconds) ‘Say Min Sy Soh’, whilst another feature of that same landscape, K.Frimpong unfurls a rather sweetly played placable trumpet swooning, spiritual like hymn, ‘Abrabo’. Down south on the Cape Coast it’s a family affair, as Ebo Taylor and son collaborate on junior’s, ‘mondo soul funk’, plaintive holy call, ‘Children Don’t Cry’. Further along the coast to Accra, and a treasure trove of riches includes the self-styled ‘ladies man’ Rob, whose narrated languid MC style vocal flows over a cowbell paraded shoe shuffling groove and one note sustained organ accompaniment. Proudly proclaiming a knowledge and proficiency in a myriad of musical disciplines and styles – including Bolero and Cuban Rhumba – The African Brothers polygenesis roll call of influences makes for some jerky sweltering party mode anthems; such as this hot-stepping dance highlight, ‘Wop Me A Ka’ (incidentally recorded at the PYE studios in Oxford Street, London). On an album of rarities, the dusty Memphis drum thumping, incessant Farfisa (again) ‘muslim’ shake and rattle of Los Issifu And His Moslems – only the band leader was actually muslim, but the name sounded right – and staccato fashion, wafting sax ‘Gbei Kpakpa Hife Sika’ by Waza-Afriko 76, are both extremely obscure; along with the earlier mentioned Tony Sarfo, all three are making their ‘northern hemisphere debuts’. 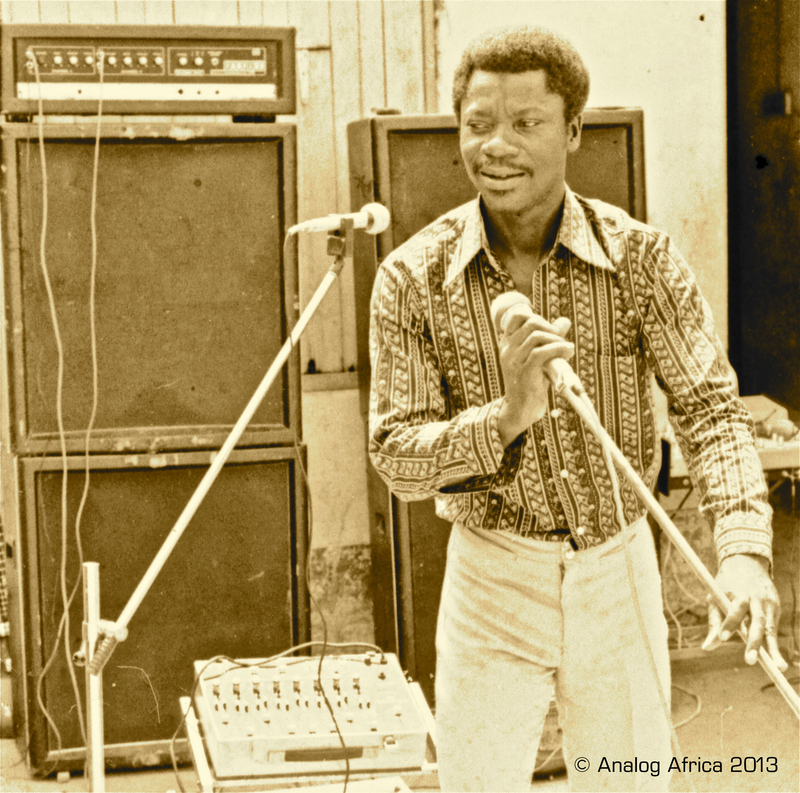 Contributing two tracks to the compilation, drummer extraordinaire, Frank Kakrah sat in with, at various times, the Okukuseku No.2, Saints ’73’ and the mighty Barbecues before joining scene stalwarts, Cubanos Fiestas. He would also lead his own band, under both the De Frank’s Band and De Frank & His Professionals, monikers. The latter, ‘Waiting For My Baby’, sounds like an infectious Afrobeat version of ‘Louie Louie’ mixed with an electric bamboozled trumpet and constant ebb and tide rhythmic side-step. Brought back to life then, the mid 70s to early 80s Afrobeat phenomenon is keenly and eruditely represented by these thirteen floor-fillers. Not just a worthy lesson in musical heritage, but a finger-snapping essential purchase: buy, buy, buy!!!!!!!!!!!!!!!!!!!!!!!!!!! Too young to pick up on the original halcyon days or be even aware of the Cabaret Voltaire, I had to backtrack from the group’s, helmsmen, Richard H. Kirk‘s ‘artificial intelligence’ Warp record appearances in the 90s. Sheffield’s progenitors of synthesised protest resequenced the sound of military jargon, collatial damge, napalm and the bleak industrial abandonment of their hometown into techno and imbued sloganist pop. There at the very birth of electronica in the UK, the Cabaret’s distinct dystopian battered music either rubbed shoulders with or influenced every notable band of the day, including Joy Division, The Normal, Human League and Throbbing Gristle. Rightly heralded as visionaries, the band are now enjoying a renaissance with much of their back catalogue undergoing a remastered and repackaged campaign. Mute has already released Red Mecca (first time it’s been available on vinyl in twenty years), and is now about to unleash the impressive #8385 compilation in November, with a further cannon of collated works, #7885 Electro Punk To Techno Pop 1978 – 1985 to follow. Four of their classic mid-period releases remastered on CD and vinyl (6 CDs/ 4 Vinyl). Albums include: The Crackdown (83), Micro-Phonies (84), Drinking Gasoline (85) and The Covenant, The Sword And The Arm Of The Lord (85). Also included: 12″ tracks from the period; 12″ unreleased tracks entitled Earthshaker, a DVD of the band performing live at the Bedford Boys Club (18.08.1984) and Hammersmith Palais (02.12.1984); and a DVD of their ‘long awaited’ Gasoline In Your Eye video showcase (previously only available on VHS) and four promos. Not the most comforting of band names for obvious connotations – namely certain south east Asian massacres – the Killing Fields Of Ontario are thankfully less mournful or despondently morose than that moniker might first suggest. That’s not to say they’re not plenty full of forlorn; composing the sort of expansive mediations on the elements and lovelorn forbade you’d expect from the picture-esque wilderness of the Ontario coast and mountains. The latest single, ‘Cloud’, is a whispery bearded and robust folk twanged anthem to a mythologised tale of woe; juxtaposing a tumultuous lament with the embracing allure and abandon of the clouds. Despite the illusion to Canada and ‘outdoors’ allusions, the band are actually from the less picture-esque city of Leeds. A percursor to their second LP, the apocalyptic but disarming, How The World Ends (out on 28th October 2013), the single is pretty much a perfect indicator of direction and style. Piquing my interest with ‘Over, Under’ a while back, composer of nuanced chamber electronica, David Lawire is back with a new mini-EP, Storm Petrel. Continuing to merge classical instrumentation with atmospheric rich synthesised washes and rasping baselines, Lawrie once again draws on loss and the pains of being pure of heart, to produce three more soothing, majestic paeans. The leading track – which features a cameo from the petrel seabird of the title – paints a cosmos of feelings within a naturalistic idyllic setting of turbulent seascapes. Creaking floorboards, thumb piano and suffused sheet metal wobbling crushes act as the binding soundscape, as Lawrie’s fragile vocals just about manage to hold up. Our featured track, ‘Feline (For My Childhood Friend, Liam, Who Died Young)’, is as the title suggests a poignant, personal reflection on mortality: innocently introduced with the cat’s tongue licks of ‘adoration’. Stark and dulcet with dulcimer like minimal backing, the song swells from strained utterances of mourning to softly vapoured and pounded electronica pop. Bonus track, ‘Liquorice Root’, is another soundtrack-esque lament of broken beats and spindly strings, ripe with analogies to mellifluous confectionary. Available now on Bandcamp or limited to 250 copies on ‘heavyweight virgin vinyl’. Featured back in my Polygenesis Perusal revue (READ HERE) a few months back, Malkovich‘s L.A. chronicles, Great Expectations, received my humble seal of approval. Joined in his many misadventures and travails by a loose collective of fellow mavericks, the album’s most languidly poised and steely nigh time operational cut and roll call, ‘Through The Trees’ is now accompanied by this Hashim Thomas video.